Some times you can’t go past a traditional pair of teardrop wedding earrings. The Poppy earrings are the ultimate classic bridal earrings with style to last the ages. The silver Poppy teardrop wedding earrings are all about un complicated style, with a sparking drop feature and leaf design. Its never been easier to match to your other jewellery pieces and dress together. The Poppy wedding earrings are a part of our Halo wedding jewellery collection, a collection of classic bridal jewellery for the contemporary bride to be. You can match so many pieces with the poppy earrings! I love the Boho hair piece and the Aura wedding hair vine. If wearring with a wedding necklace choose a delicate design consider the Glamorous wedding necklace. A wedding dress with a sweetheart neckline or V neckline gown will highlight this design. Beautifully packaged in a pink silk box, this will keep you darling earrings safe for many generations to come. 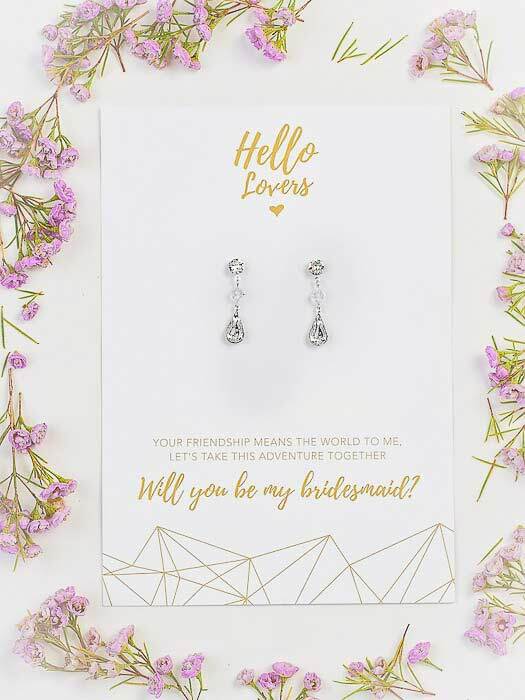 You can have the poppy teardrop bridal earrings packaged on a” will you be my bridesmaid card“. 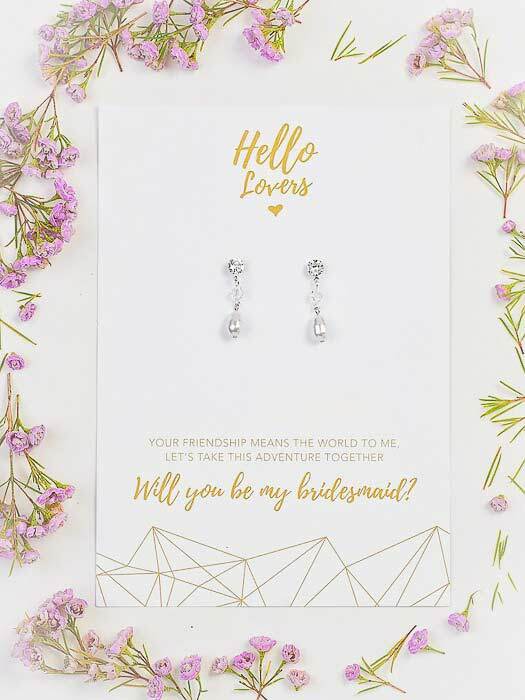 These pretty silver earrings are great for bridal party gifts. The earrings teardrop design suits most face shapes too. Great gift to complete your bridesmaid dresses. And one they will think of you every time they wear them in the future.